Investigating Cervantes' view of female roles in the contexts of early 17th century Spain and the Renaissance artistic method of , Nadeau analyzes the classical models for his portrayal of women cited in the famous work's prologue. Noting that Medea and the other mythic figures featured were all powerful but socially unacceptable women, she reads Cervantes as transforming these tales toward greater freedom for his female characters and himself. 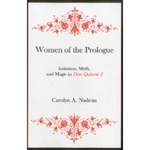 Based on a 1994 doctoral dissertation from Pennsylvania State U.
Nadeau, Carolyn A., "Women of the Prologue: Imitation, Myth, and Magic in Don Quixote I" (2002). IWU Authors Bookshelf. 22.